If you have an upcoming event at the Barcelona Fira Conference Centre and you hate being hangry, you've come to the right place. We've had clients tell us year after year while attending GSMA MWC, "where do we eat around here!? ", so we decided to come up with a list for our dear clients and you lucky readers. 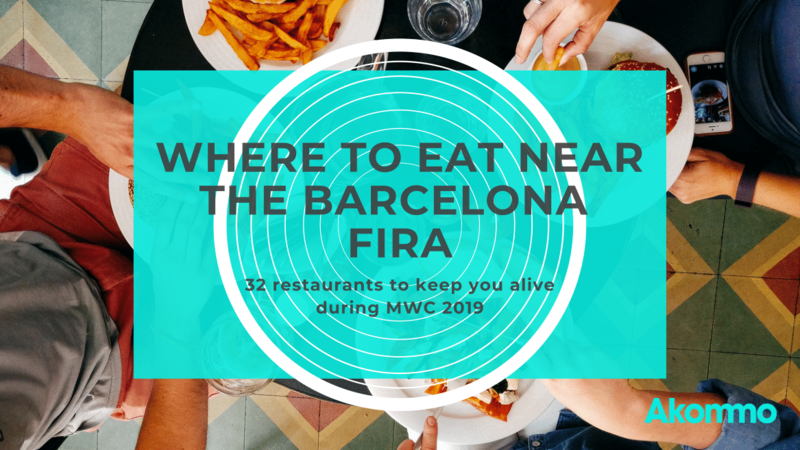 Here's the most extensive restaurant list of Where to Eat Near the Barcelona Fira, so all of you have to worry about is where to get the best tapas in the area! Buen provecho, bon profit, bon appetit! This trendy restaurant will provide excellent service, fresh dishes, ​and a gorgeous space to enjoy a nice meal after a long day of event attending. 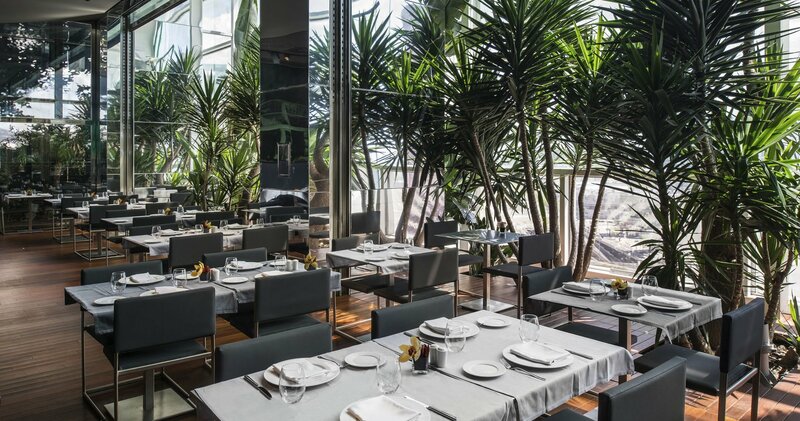 Located within the Barcelona Renaissance Fira Hotel, this chic restaurant provides a sophisticated atmosphere to enjoy either dishes a la carte, or from their fixed menu of the day. Enjoy your meal in a green oasis surrounded by palm trees in the vertical garden of the Renaissance Fira. 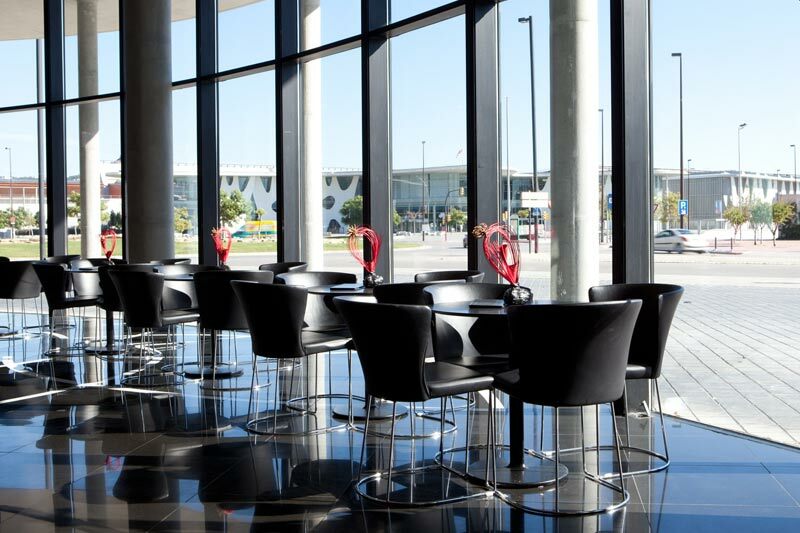 PS- if you're going in a group during Mobile World Congress or other popular conferences, be sure to make a reservation! Located less than 10 minutes from the Fira de Barcelona, this restaurant located on the premise of the Euro Hotel Gran Via Fira is a spacious, under-the-radar eatery. You can enjoy a selection of fresh, Mediterranean dishes, prepared with care and with the healthiest ingredients. Enjoy a quick walk from the Fira and the tranquility of this restaurant tucked away from the conference madness. If you're looking for a healthy, affordable, and quick meal, this is your best bet if you're in a time crunch. They have fresh salads, soups, sandwiches, smoothies, delicious coffee, and a selection of yummy pastries. This recently opened in 2017, and has become a reference point at the Fira. If it's nice weather, enjoy their terrace and the Barcelona sunshine! 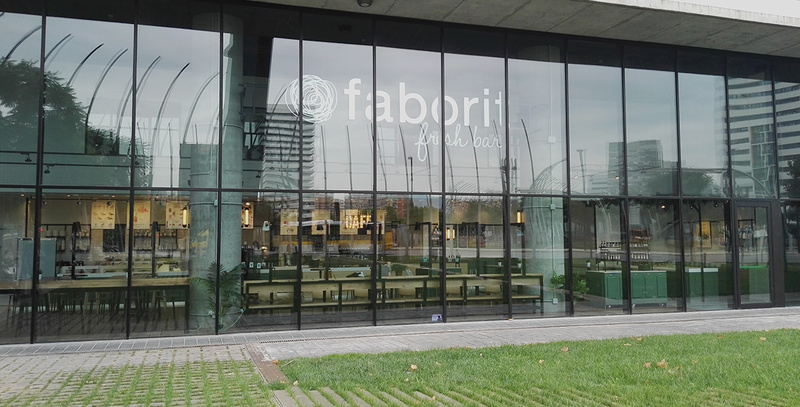 Expect to wait a bit as Faborit almost always has a long queue. Just a quick walk from the Fira de Barcelona, La Pepa is a classic Catalan option. If you are looking for an authentic, affordable, and a spacious place for groups, this is a close option for you and your colleagues. La Pepa specialises in tapas, rice dishes, and stews, and will even prepare a personalised menu for large groups. Be sure to make a reservation! This brand new restaurant is the best option if you're in the mood for something"bueno, sano, rápido", which means "good, healthy, and quick". 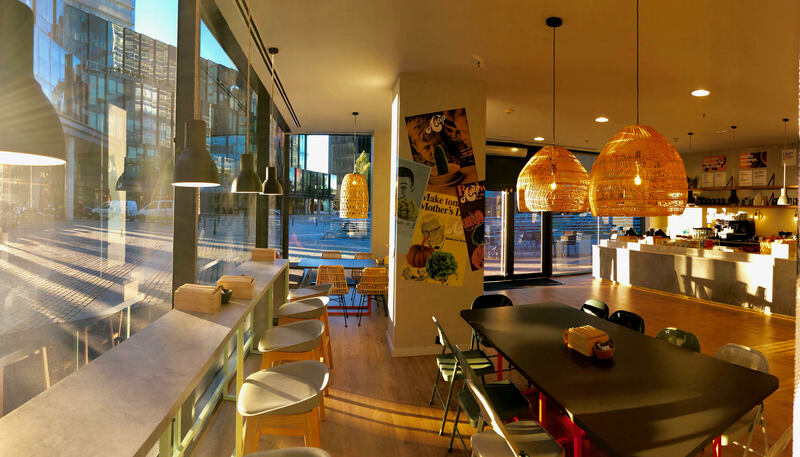 The concept is fast, good food, and what better way to start your day than with a meeting over a healthy breakfast near the Fira de Barcelona? Trust us, this is one of the healthiest and trendiest options you'll find in the Hospitalet de Llobregat area. Just look how beautiful their restaurant is! Italiano, anyone? If you've had a long day at the MWC, or even just a long morning, and you need to eat your body weight in pasta, here's our go-to. This spacious restaurant is a great place if you're looking for a restaurant near the Fira de Barcelona for groups! 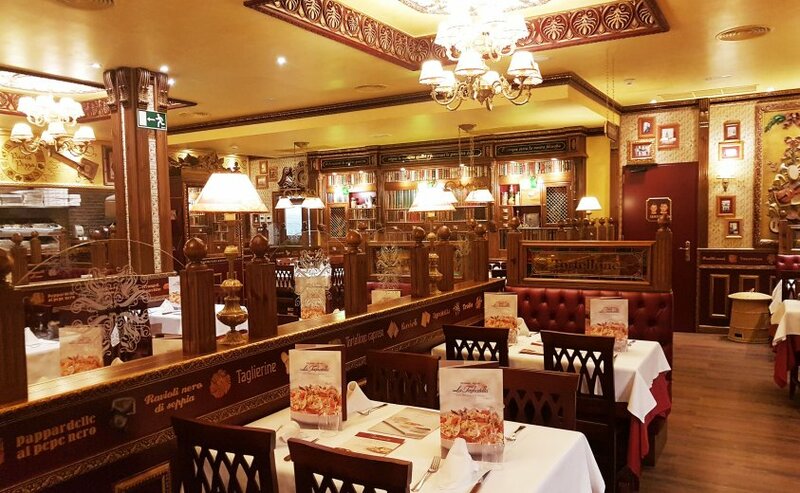 They have all of the classic Italian favourites, from soups, to pizza to pasta, and even an affordable menu of the day. Buon appetito! If you're looking for an affordable meal with a great bang for your buck, this is a great option located within the shopping mall. The fixed lunch menu of the day is tasty and fresh, and you can order dishes like grilled white fish or salmon, go up to the bar and get a round of Basque pintxos, or enjoy a large salad with baked goat cheese! Wash it down with a beer and get ready for your afternoon ahead of events. This hamburger joint is a must if you're at a conference at the Fira. This rock-n-roll restaurant is related to the famous Ace Cafe in London, where the Ace story came to life. You'll see an interesting crowd here, from event attendees at the Fira, to people dressed in leather biker gear. Definitely worth the 10-minute walk! Narandam Restaurant is located within the Hotel Fira Congress Barcelona just 10 minutes from the Fira Conference Centre. The Narandam offers a wholesome menu of the day, with attentive service and a wide range of options. Depending on the day, especially during major events like MWC, this makes for a very busy place and might take a while to get seated or get your food. Not to mention, it's right on the premise, just behind the Fira, making it a popular destination for event attendees. Narandam also makes for a casual place to get a drink or coffee in between events. If you're looking for traditional Catalan cuisine with an unpretentious vibe and cheap prices, El Castell De La Fira is a close by spot for you and a few colleagues to have lunch and a couple of beers. The menu is traditional with dishes that locals love and enjoy daily, such as canelons, tortilla de patatas, fried calamari, escalivada, artichokes, and more. Be sure to be full as the portions are large and the prices are cheap! Always be on a seafood diet in Barcelona. You see food, you eat it. Click here to download your free copy of the ultimate Barcelona food guide. Bon profit! 11.) This & That Co. If you're in the mood for tapas, quality meats and Michelin star meals, This & That Co. is a great spot for a delicious meal in L'Hospitalet de Llobregat. The dishes are carefully prepared, and your palate will certainly be pleased after dining here. It's one of the pricier restaurants in the area, but one of the highest quality as well. Be sure to make a reservation as it's a small restaurant and fills up quickly! 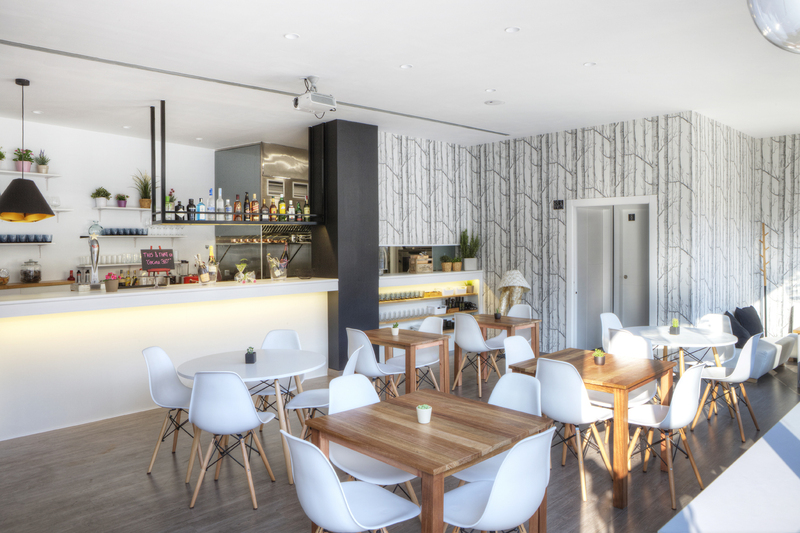 Situated in the heart of the Hospitalet de Llobregat village, this restaurant is a great place to relax with some homemade tapas, a nice selection of wines, and a family-style service. The prices are fair, the service is very friendly, and the paella and croquettes are a must-try. It's a humble and cosy little nook, but expect to try some flavourful and delicious Spanish dishes here! 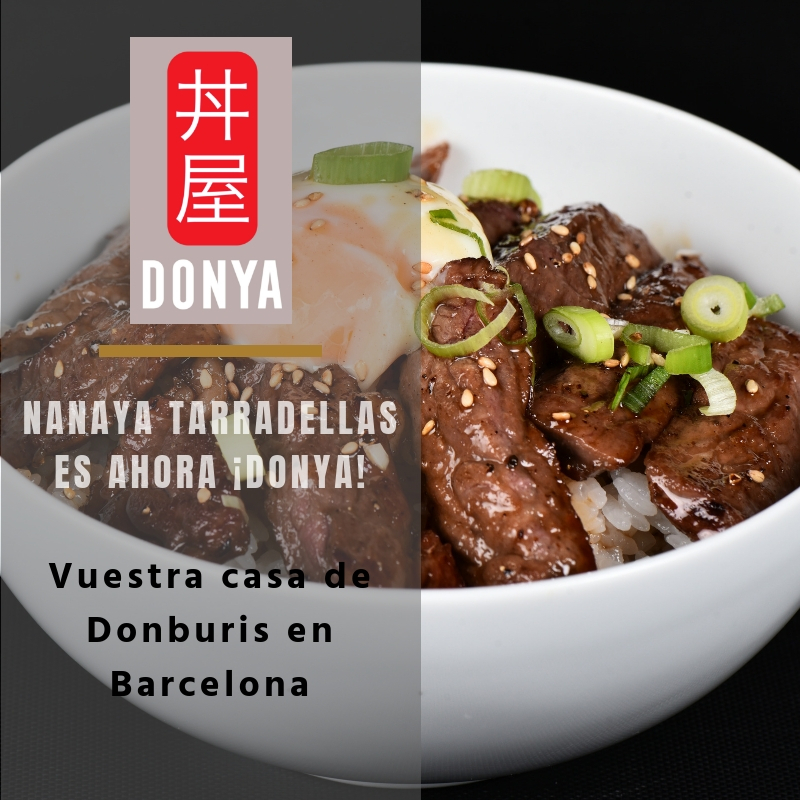 If you're looking for a nice place to go get beers and tapas after a long day of events at the Fira de Barcelona, don't hesitate to check this restaurant out! It offers a simple menu with traditional tapas and pasta, salad, fish, and meat dishes, has a selection of beer and wine to try from, and the natural lighting makes for a cosy place to have a calm lunch during event madness. La Buena Tabla is located just under 10 minutes from the Fira if you're looking for a nice walk to decompress between events and your lunch. This restaurant is where you'll find locals enjoying a traditional meal with a nice glass of Spanish wine during their lunch break. You'll have to compete with the locals to get a table, especially if you want to sit on the terrace if the weather is sunny! It's ideal to go with groups so you can split the tapas and try a bit of everything! In the mood for pastries and coffee rather than a full sit-down meal? The Viena chain of cafes can be found all over Barcelona and make for a decent spot to have a quick coffee and croissant or the traditional Spanish "bocadillo" or baguette sandwich. If you're looking for something quick and carb-loaded, this is your spot. If you're looking for something a bit more elaborate, look elsewhere on this list! Want to relax after a long day with some cheap fried tapas and a large cold beer? This is your spot if you're in need of a cheat meal with some colleagues. The staff usually speaks English and is quick to bring you a beer or two! This is a cheap chain restaurant in Spain, so don't expect the highest quality ingredients in the city. It's not a bad place for a quick bite in between meetings or to start your night off before heading into the city. Hands down the best Japanese in the area, this restaurant is a great option for all lovers of authentic Japanese food. From sushi, to gyozas to yakisoba dishes and even wagyu tartar with avocado, this place is one of the best eats in the area. You can also order your food ahead of time and pick it up to go if you're in a rush! 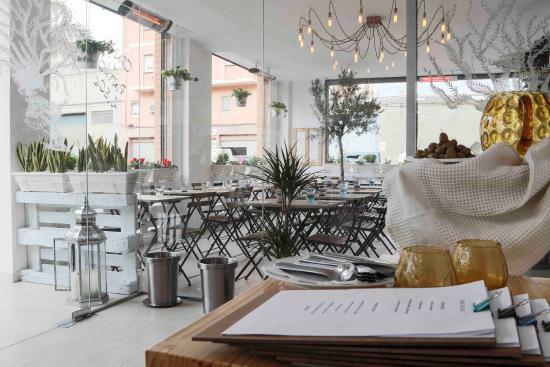 Don't miss out on this restaurant, as it's one of the best in the Hospitalet de Llobregat. 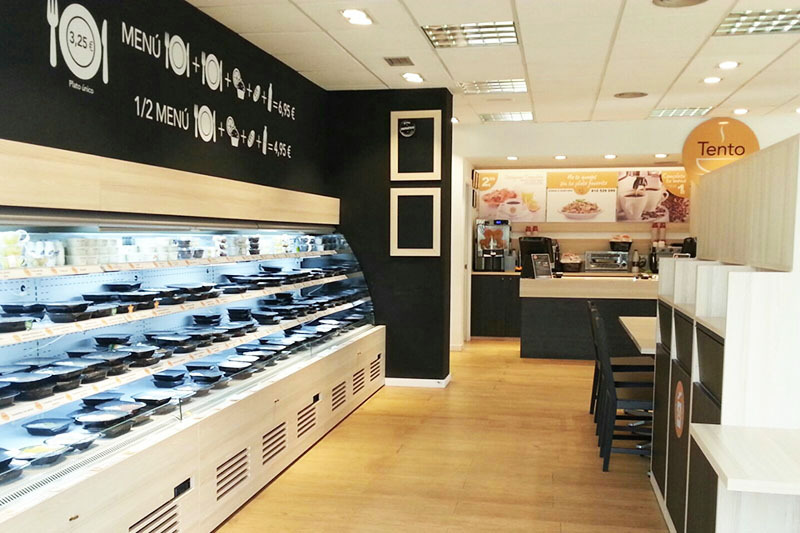 Another esteemed chain in Barcelona, the Farggi Cafe is a great place to enjoy a delicious and healthy salad, a freshly made sandwich, a hot cup of coffee, and some of the best gelato in town! The prices could be cheaper, but the Farggi coffee is truly delicious and worth the walk. If you need something quick and don't want to eat fried food, this is a great option. Craving late-night Italiano? 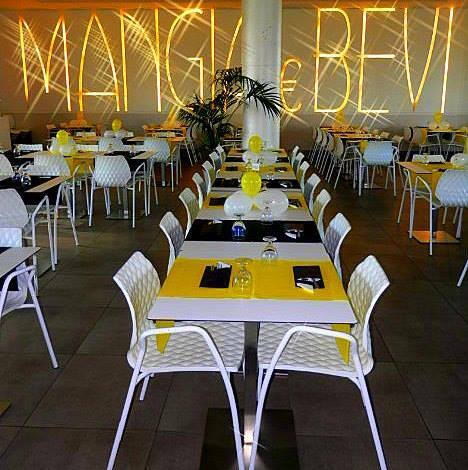 Mangia y Bevi is a great option if you're staying in the Hospitalet de Llobregat area and are having carb-heavy cravings. Just a 7-minute walk from the Fira Centre and the excitement of the area is this spacious Italian restaurant. It's cheap and quick, and sure to fix your pizza or pasta craving. Be sure to get there at least an hour before closing time if you want to secure your meal! Though it's located a bit further than the rest of the restaurants in the area, El Restaurante Piripao is worth the walk if you're craving local fare and a local experience. This restaurant has been open for more than 15 years, and there's a reason that locals keep coming back for more. What's more, they've got local beers on tap and is the perfect place to relax after a long day of events at MWC. Found inside the Gran Via 2 Shopping Centre, this chain restaurant serves up meats of all different types fresh off the grill. 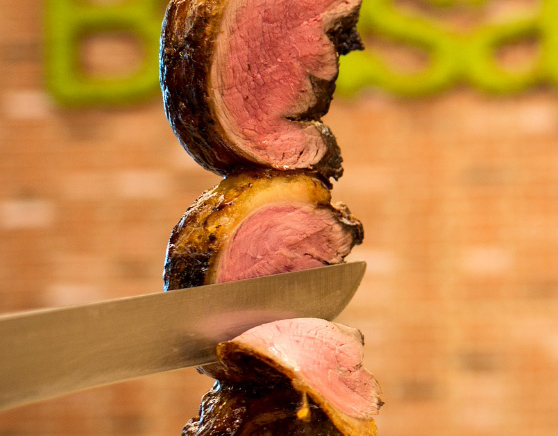 If you're a meat lover, this is definitely the perfect spot for you to chow down on some local sausages or picanha! It's a cheap eat, so don't expect the world's finest meat selection. If you're in the mood for something quick, affordable, and near the Fira Gran Via, check out this grill. Situated just a quick 4-minute walk from the Fira Barcelona Gran Via, the Restaurant El Roble is an excellent spot for large groups. The restaurant has a max capacity in their main dining hall of 100 people, and their specialty is the Spanish "tortilla de patatas", which is similar to an Italian frittata, minus the crust. If you and your team are staying in the area and want to have a group meal near the Fira, el Roble is an affordable option. This restaurant and bar has been next to the Fira for countless years, and is famous for having an affordable and fast menu of the day. They specialise in quick, traditional menus of the day, with a specialty in Catalan classics like stews, meats, and rice dishes. The food is standard, conveniently located, and affordably priced. Not to mention, it's a popular place for locals working in the area, so be prepared to wait in line at lunchtime. 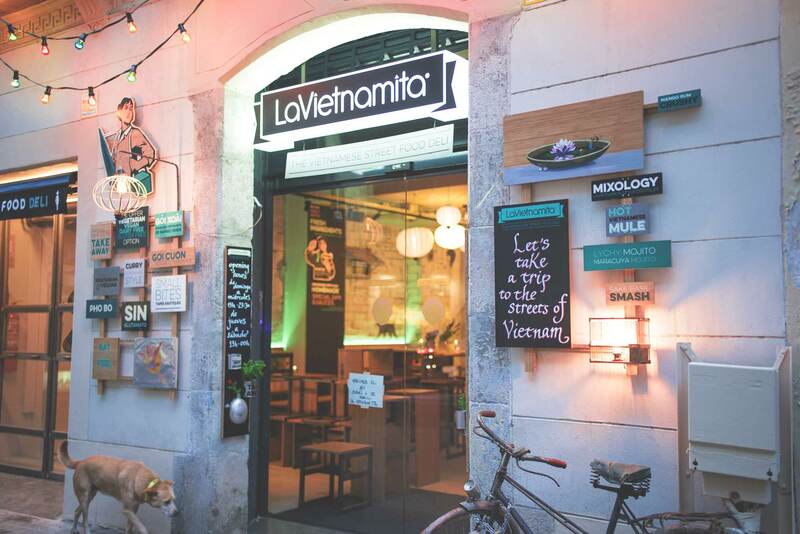 This little Vietnamese pop-up restaurant has quite heavily established itself at the Fira as one of the best (and closest) options for food in the area. Due to its location, directly inside the Fira Barcelona, you can't get much closer than this! The food is delicious but be sure to watch out for the prices, they'll definitely get you due to the convenient location! For just €9.95 you can enjoy a daily menu of the day, including coffee, which is pretty hard to come by these days in Spain. The food is plentiful, and you'll certainly leave the restaurant feeling full. Walk just 10 minutes behind the Fira and you'll find this little hole in the wall with a delicious stew and some great local craft beers. One of the largest Italian chains in Europe, La Tagliatella is consistent and serves up a heaping portion of pasta. If you've had a long day, sometimes you just want to eat an embarrassing amount of carbs and wash it down with a glass or two of local red wine. We won't judge you and we won't put it past you if you manage to finish an entire plate of pasta or pizza. In fact, we'll applaud you. La Tagliatella tends to have a huge queue around lunchtime and in the evenings, so be prepared to wait a bit. "Pan", meaning bread in Spanish, is abundantly available at the Pans & Company located inside the Gran Via 2 Shopping Centre. From freshly made sandwiches, chips, to croissants and other pastries, to salads and more. If you want a quick sandwich and coffee fix this is a great option. It's quick, clean, affordable, and has WiFi available if you need to connect while abroad. 28.) IKEA - have you tried their meatballs?! OK, before you make your judgments, just answer the question above. So, have you ever tried their meatballs? We are suggesting this as an actual food option because they make delicious, cheap, fast, and occasionally healthy (depending on what you order) meals. Not to mention if you're starving and there's nothing around, a 6-minute walk and a 1 euro hot-dog might just sound like the perfect meal. 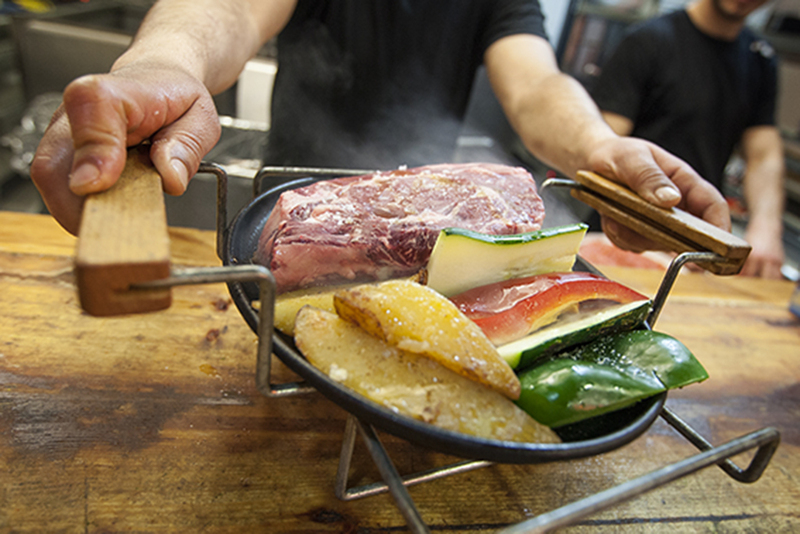 One of the most famous fast, and home-cooked, restaurant chains in Spain, Tento serves dishes that are ready to eat or heat for affordable prices. If you want something that hasn't been deep fried or 1000s calories, you can get a few delicious and affordable options at the Tento Europa! Buy your food, heat it up in the microwave in the restaurant, and sit and have your 30 minutes of you time while you eat a "grandma's style" Catalan dish. The Nuclo Restaurant is one of the only finer dining restaurants in the area, and is a great place to go for nice business lunch during MWC in between meetings. This restaurant is full of surprises for your palate, with dishes prepared with local fresh ingredients from the market, as well as creative twists on traditional Catalan dishes. Be prepared to spend around 30-35 per person for a menu of the day. Situated within the Hotel Barcelona Porta Fira, this is one of the closest cafes/bars where you can find a quality meal with attentive service in a 4-star hotel. This iconic red building is a landmark near the Fira Gran Via, and you'll be able to spot it from the conference centre as it's just a stone's throw away. Order a large glass of local wine, a pint of Spanish of beer, and a few snacks to munch on after a long day. Don't feel like eating at a restaurant? We don't blame you, eating out can feel like a chore after awhile. If you'd rather just get something light like fruit and vegetables, a ready-to-eat salad or sandwich, or even freshly prepared sushi or pasta, the Carrefour Supermarket has the widest range around. Go have a look around, see what local Spanish grocery stores have to offer, and even buy some sweets or delicacies to take home with you!